At a glance Take your dream getaway sooner Earn 3 Avios on purchases with Iberia, British Airways, and Aer Lingus & 1 Avios on all other purchases. * Same page link to Offer Details Redeem Avios on Iberia or any oneworld alliance partners. * Same page link to Offer Details Terms apply. Use your Bonus Avios towards rewards flights. All reward flights are subject to taxes, fees, and carrier charges. * Same page link to Offer Details This product is available to you if you do not have this card and have not received a new cardmember bonus for this card in the past 24 months. Rewards Program Agreement: For more information about the Iberia card rewards program, view the latest Rewards Program Agreement. We will mail your Rewards Program Agreement once your card account is established. If you become a Chase Online customer, your Rewards Program Agreement will also be available after logging in to chase.com. How you can earn Avios points: You'll earn Avios points when you, or an authorized user, use an Iberia credit card to make purchases of products and services, minus returns or refunds. Buying products and services with your card, in most cases, will count as a purchase; however, the following types of transactions won't count as a purchase and won't earn Avios points: balance transfers, cash advances and other cash-like transactions, lottery tickets, casino gaming chips, race track wagers or similar betting transactions, any checks that access your account, interest, unauthorized or fraudulent charges, and fees of any kind, including an annual fee, if applicable. 4 Avios points on up to $30,000 in purchases your first year: You'll earn 4 Avios points for each $1 spent on purchases for your first 12 months from account opening, or until you reach $30,000 in purchases, whichever occurs first. This is an additional 1 Avios point on top of the 3 Avios points earned on flight purchases made directly with Iberia, British Airways, LEVEL, and Aer Lingus, and 3 additional Avios points for each $1 spent on all other purchases. After that, you'll earn 3 Avios points: You'll earn 3 Avios points for each $1 spent on flight purchases made directly with Iberia, British Airways, LEVEL, and Aer Lingus. 1 Avios point: You'll earn 1 Avios point for each $1 spent on all other purchases. Information about earning/transferring Avios points to Iberia: Avios points earned during a billing cycle will be automatically transferred to Iberia after the end of each billing cycle. Avios points expiration: Avios points will expire according to the Iberia Plus Program Terms and Conditions which include maintaining Iberia Plus program activity for 36 consecutive months. Losing Avios points: You'll immediately lose all Avios points that haven't been transferred to Iberia if your Iberia credit card account status changes, or your Iberia credit card account is closed for program misuse, fraudulent activities, failure to pay, bankruptcy, or other reasons described in the terms of the Rewards Program Agreement. Subject to Iberia flight availability. Taxes and fees apply to the full value of the ticket, including the $1,000 discount voucher. Iberia Plus terms and conditions apply. Cardmember must make $30,000 in Purchases in a single calendar year on their Iberia Visa Card to receive a $1,000 discount voucher. Purchase transactions must post to your billing statement on or before December 31 of the calendar year in order to qualify for the $30,000 spend. ("Purchases" do not include balance transfers, cash advances, travelers checks, foreign currency, money orders, wire transfers or similar cash-like transactions, lottery tickets, casino gaming chips, race track wagers or similar betting transactions, any checks that access your account, interest, unauthorized or fraudulent charges, and fees of any kind, including an annual fee, if applicable.) The discount voucher will be in the form of a code that can be applied by a Cardmember for a discount of $1,000 when purchasing two tickets, for the same flights in the same class of travel. Cardmember is eligible for only one discount voucher each calendar year. The discount voucher will be issued after the billing cycle when Cardmember reaches $30,000 in purchases. Cardmember will receive a discount voucher email from Iberia 4-6 weeks later, and will not be eligible for another discount voucher until the next calendar year. The discount voucher email from Iberia will include a discount voucher code that must be redeemed online at www.iberia.com/Chase10. Once the discount voucher is issued, credits to the Iberia credit card account will not cause forfeiture of the discount voucher. The discount voucher is valid in conjunction with the Cardmember's paid two same flights on Iberia taken within 12 months of the date of issue. All discount vouchers will be issued in the name of the primary Cardmember who must travel on any booking where the discount voucher is used. The discount voucher is only valid if it has been acquired in accordance with the rules of this promotion. The discount voucher is not extendable, transferable and has no cash or Avios value. Companion must travel with the Cardmember on both the outbound and inbound journey and be booked at the same time for both directions. Discount vouchers may only be used for flights which are operated by Iberia. The discount voucher is not valid for flights operated by franchise, codeshare or alliance airlines. Additional restrictions may apply. Please visit iberia.com/Chase10 for full terms and conditions. This offer is not from Chase, and Chase Bank USA, N.A. is not responsible for the provision of or failure to provide the stated benefits and services. Valid only for new flight bookings with a valid Iberia Visa card issued by Chase, for travel commencing on Iberia from any destination. Discount is valid on the flight fare only and taxes, fees and carrier charges are excluded from the discount, on mainline flights operated by Iberia. Cardmember must travel to qualify for the 10% discount. To take part in this promotion, eligible participants must log in at iberia.com/Chase10 to make a roundtrip booking. Offer is non-transferable and available on Iberia flights only, not valid for discounts or with any other promotions, unless otherwise stated. To be eligible for this bonus offer, account must be open and not in default at the time of fulfilment. 10% discount will appear on the availability page. Discount is not valid for flights on code share or franchise carriers. 10% discount on Iberia flights is valid for flight purchase only and does not apply to excess baggage fees, seat assignment fees, purchasing Avios for rewards or rewards fees. Roundtrip bookings are eligible for only one discount. All rules of purchased fare apply, including advance purchase, minimum stay, weekend-add-ons, and cancellation/refund rules. Other travel related restrictions may apply. Fares not purchased at iberia.com/Chase10 do not qualify for discount. Discount applies for up to nine passengers booked on the same Iberia flight at the same time. Refunds from previously purchased fare types not permitted. Iberia standard booking terms and conditions including amendment and cancellation charges apply. All travel is subject to availability. Other significant restrictions may apply. Visit iberia.com/Chase10 for full terms and conditions of fare rules. Offer is not from Chase. Chase Bank USA, N.A. is not responsible for the provision of or failure to provide the stated benefits and services. Avios can be redeemed, subject to IBERIA Plus programme, for reward flights on Iberia and its airline partners to over 900 destinations worldwide. Airline partners include Alaska Airlines, American Airlines®, Aer Lingus, British Airways, Cathay Pacific, Finnair, Japan Airlines, LATAM, LEVEL, Malaysia Airlines, Qantas, Qatar Airways, Royal Jordanian, and S7 Airlines. Existing Iberia Plus members will be prompted to enter their Iberia Plus membership number. If you are not already an Iberia Plus member please visit iberia.com in order to enroll. Avios will be deposited in your Iberia Plus account within 4-6 weeks. Redemption of Avios for travel is solely the responsibility of Iberia Plus. At time of this publication all reward flights and travel together tickets are subject to taxes, fees and carrier charges of approximately $682 - $1,250 per adult in economy or $1,250 in business class based on travel from Seattle to London. Accounts subject to credit approval. Restrictions and limitations apply. Iberia Plus credit cards are issued by Chase Bank USA, N.A. Offer subject to change. You must be a member of the Iberia Plus program. If you are not already a Member, you will be enrolled automatically if you are approved for the Iberia Visa card. Avios accumulated through the Iberia Visa card will be transferred to your Iberia Plus account; however, Avios reported on your monthly statement from Chase may not post into your Iberia Plus account if you change your Iberia Plus address to one outside of the US. 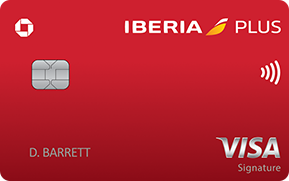 Avios earned with the Iberia Visa card will not be credited toward Iberia Plus tier level progression or retention. For rules and regulations of the Iberia Plus program, please visit iberia.com. Redemption of Avios for travel is solely the responsibility of Iberia. British Airways, Alaska Airlines, American Airlines, Aer Lingus, Cathay Pacific, Finnair, Iberia, Japan Airlines, LATAM, LEVEL, Malaysia Airlines, Qantas, Qatar Airways, Royal Jordanian, and S7 Airlines are trademarks of their respective companies.